An accessibility expert weighs on how accessibility in games is vital, and 'difficulty' is relative. 1; my focus as a consultant on games, working with AAA developers like Guerrilla to Indies like Gambrinous – is an area of ​​game design that is often deeply misunderstood; it's about barriers, not difficulty. So, at focusing on "difficulty modes" we might miss out on opportunities to be able to welcome more players because they can perceive any number of barriers to pain or stress free as "difficulty". I'm not just an expert trying to shed some light, but also as a passionate of grueling games like Souls-likes who wouldn't diminished their defining qualities. Before I launch into the thick of it, it's important I explore why I like punishing myself so much with said grueling games. It's fundamental to understanding why on Earth anyone would want in on that. I have physical and cognitive disabilities with overly complicated medical names, but it boils down to muscle strength and pain. My joints dislocate and I injure easily (more pain). We had strokes that affect things like memory along with brain fog, and so too autistic and have ADHD which all affect my ability to process any kind of information, organize tasks and think quickly. Because playing any child is just a physical task, but a cognitive one too. So, I'm disabled and I completed Bloodborne solo, beating most bosses in around two to five attempts. It was an intense emotional experience; harrowing at times, uplifting, dusting, terrifying, beautiful, shocking, and painful. It's a method of storytelling that is unique, affecting, and quite indescribable. For me, this is the heart of Souls-like games, and it draws me again and again. The Surge is the only game in 30+ years of playing games that I have completed three times! Quite the statement for a player with ADHD. The experience of a soul-like leaves me raw and vulnerable in a way no other game does. The act of repeatedly failing, combined with seemingly unbeatable odds is beautifully contrasted with my natural abilities to persist, find strength amongst weakness, and learn. I'm a heavily determined person, often much to my own detriment, and these games reward that. Despite my cleverness and absolutely dogged resolve to succeed, I'm left exhausted and utterly vulnerable. I am often beaten to within an inch of flailing despondently, but I find a way to come back victorious. Or how that's good souls-like ingeniously makes me feel through subtly crafted mechanics and near-invisible guidance. While I'm on the move or tear, utterly broken, mumbling shakily, I can do this, I have a breakthrough; I scrounge up the last of my courage, grit, and strength and… I win. Just like that. It's a truly fascinating psychological and physical journey because it's more to it – it's the intimate relationship between mechanics and story. The stories at their core are always about transcending the darkest times, beating the odds, and striving to come back from nothing short of desolation. The way the punishing gameplay echoes the storytelling is so commanding, it can only be experienced by playing. It's such a simultaneous ugly and beautiful representation of life and existentialism. For me, these games are special because it's so much like my life. Being disabled is about navigating the world in permanent hard mode; constantly facing barriers, threats, and the painful realities of existence, yet a survivor because I'm human. It says a lot about the concept of difficulty that I can make that analogy. Sure, there are some things I can do, and that's okay; it's life, for everyone. But for disabled people, we often can't join just because no one thought of us. It is unbearably isolating and has to be faced with other people's palpable joy and camaraderie when you have to watch from the sidelines, again. It's also not always in an all-or-nothing situation. Sometimes, doing the thing is painful or extra exhausting (i.e. harder than it should be). So, yes, I completed Bloodborne, but in doing so I was left with hand injuries that took months to heal – and not being hyperbolic. Playing exhausted me, both mentally and physically. It makes me hyper-aware of my limitations as a disabled player. 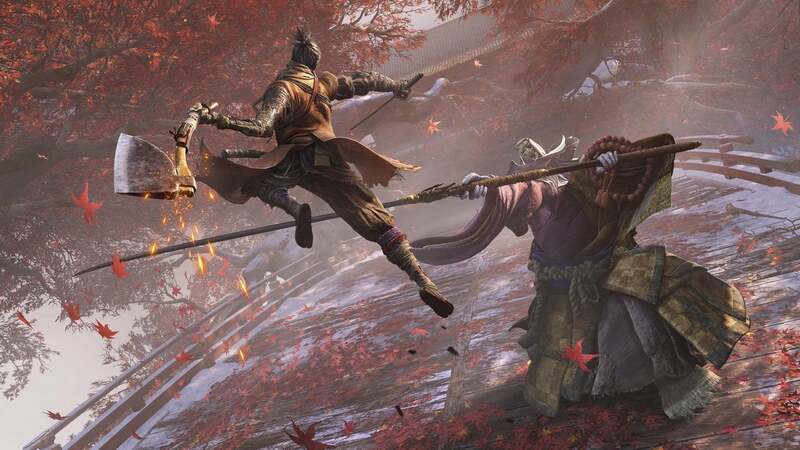 When a game like Sekiro: Shadows The Twice is released, the discussion often turns to "difficulty modes" in part because people want to join in, in a healthy way that works for their needs. They're tired of being shut out, just being made to feel inadequate because of their limitations. They desperately want to be a part of the hype. Missing out on the latest big deal really hurts, especially when it happens as often as it does for disabled people. With the screams of "Git Gud" comes the fundamental misunderstanding of what accessibility is actually. Is it "difficulty modes"? That's sometimes a small part of it, but it's also so much more. Difficulty options are just one potential axis in which to solve unintentional barriers that are disabled – and plenty of non-disabled – players face, but they're not always the best way to solve them. In my job, I actively encourage teams to approach the subject with nuance and creativity because there is the frontal misconception that disabled players can, well, "play on easy." barrier '? Games are at their core, a set of barriers arranged to create a challenge, mixed with the illusion that you're solving it all yourself. There are times, however, where developers might have created barriers we don't realize are. It's why we playtest, and it's how we end up accidentally excluding players, especially disabled players, who we'd like to include. We deliberately mitigate and remove barriers all the time in the course of game design (Sekiro does this through its frequent checkpoint idols and the stealth indicators, for example) but if we don't design and test with the full spectrum of our player base in mind, we'll inevitably have unintentional barriers. This is where accessibility comes in – we work to intentionally include as much of our audience as possible. We can't remove all barriers and still have the game we want to make, so it becomes about making the experience as consistent as possible to as much as our audience as possible. It's about making the experience as consistent as possible to much of our audience as possible. It's important to understand that when players ask for" difficulty options "it might just be because that's the simplest way for them to communicate their needs. It's not their job to figure out the ideal solution to the barriers, but it's their role to voice their concerns or not being able to play at all, and statements about a game being "too hard" are valid. Again, difficulty is relative to the individual, and it's an abstract design concept that can be deeply connected to the way our bodies or minds function. We've become accustomed to the easy / medium / hard / ultra-mega-hard values ​​through proliferation, but ultimately… they're meaningless (look, I'm an existentialist, okay?). Disability is normal human variation, so we're already in every player base. Some who need accessibility don't identify as disabled (RSI, arthritis, back injury, broken arms, ADHD, overworked, tired, etc ..
FromSoftware has made a lot of improvements to its household formula since its early games, which shows that there is plenty of room and definitely a place for further accessibility y. As a fan, it feels like the developers are continuously refining the ultimate experience of persistence. Contrary to popular opinion, I think the Souls games are really about skill, but about encouraging people to face their demons, understand consequence, and keep going. It's also probably a little about futility, but that's for another article. There have been a lot of Quality-of-Life (QoL) improvements over From's games and this is a root of accessibility as a concept. QoL is about making sure players have a smooth experience and don't burn out before we want them. This is important for all players, but especially for players we sometimes have less energy, more pain or bigger limitations to begin with. I have something called sensory processing disorder where sounds, visuals, and haptics all overwhelm my brain; it shuts down and I stop processing information altogether. You can probably imagine the impact that would have on any game, much less a punishing one. It's not about my level of skill. The boss music in Bloodborne is sublime, but it made the fights nearly impossible for me. So, I set the music at 2/10. The sound effects were vital to the cues for moves (slow visual processing), so I left them up, but also turned down the voice because it included screams and roars. That was my secret to beating most of the bosses in two to five attempts. Likewise, the UI (menus, HUD, tutorials, skill upgrades, etc.) has been greatly improved in Sekiro. It's not perfect, but the text size, layout simplicity, and density are better than any of From's previous games. How UI is accessible is really a great way to play a super-grueling game. If you find out about reading text or trying to parse character stats, by the time I get to any child or already halfway down. So, QoL improvements are straight-up accessibility. It's not about skill. Moreover, I'm pretty early in Sekiro, but so far it does a much better job introducing things to a clear way without it confusing me or tiring me out. Again, I know from other people sharing their frustration experiences there is still room for improvement here – more information about how to play can be given to those new to the genre but not to veterans who don't need it, for instance. The training area at the very beginning is also a really important accessibility tool because it allows people a safe area (without risk of losing) to practice their timing and get to grips with the controls. I'm not here to write a full accessibility report of Sekiro (after all, as The Joker taught us, if you're good at something you never do it for free) but these are a few solid examples of settings or features that help with accessibility without being a "difficulty mode" "; challenging the idea of ​​what difficulty is. Pretty much all of the QoL improvements and existing settings lower the "difficulty" for me, making Sekiro both more accessible and approachable (yes, they're different, too). I could say the same thing about how much more forgiving the game design is in Sekiro, from timing to controls and the multiple possible play styles (stealth, charging, finesse, parrying, bashing). The fact that I am early in the morning most of the time becomes a block because I am often way too early. Hey, I'm going to do it with slow reactions to compensate for what I can say. But like I said, there is still room in a game like Sekiro for more accessibility. A glance at the meager settings menu should be enough to see that. Nothing is perfect and creators are always trying to improve and come closer to the vision they have for their players. We can achieve a lot with player-defined settings and it doesn't have to be easy-to-use per se. There are several avenues for more improvement and the fact we have so many people talking about how they want to play but can have us asking how. My hope is for us to move beyond the concept of difficulty all together into being more understanding of the spectrum of human experience. Ultimately, accessibility in games is about empowering as many different types of players as possible to have pre-defined experiences. Reality dictates that we are not all homogenous and so we need to change some things in order for it to fit us. We don´t go and buy the same sized pair of jeans! Difficulty is a construct and illusion of game design, and every setting can alter the perceived difficulty for a given player. If the camera is too high and it makes someone motion sick, suddenly the game is unreasonably difficult; even for someone we might consider highly skilled. Difficulty is a construct and illusion of game design, and every setting can alter the perceived difficulty of a given player. Importantly, I don't want to fundamentally change games like this for everyone, I want to empower more players to curate their own challenge. I want to establish trust in the players so that they know what they want and need to access a similar experience and challenge themselves to face these grueling themes. Perhaps we can move on to the options for things like button mashing are really different than inverting controls or adjusting sensitivity. It's all just adapting the experience for our individual bodies and minds. It is brilliant when it's magically woven into the game of challenging games as the core gameplay. Cherry Thompson works on accessibility in games and practices ultra-violence with feelings as a public speaker. They have a one-eyed cat called Odin who's really good at designing his own games. You can follow them on Twitter @cherryrae .